Title: "Last Hand" and "Resurrection"
Elektra catches the Kingpin's eye as he sends some flunkies to test her. He ends up hiring her as his main assassin now that Bullseye has been imprisoned. Kingpin has need of her services to silence testimony against his mayoral candidate, Randolph Cherryh. Ben Urich at the Daily Bugle, has uncovered enough dirt on Cherryh to seriously affect the campaign. 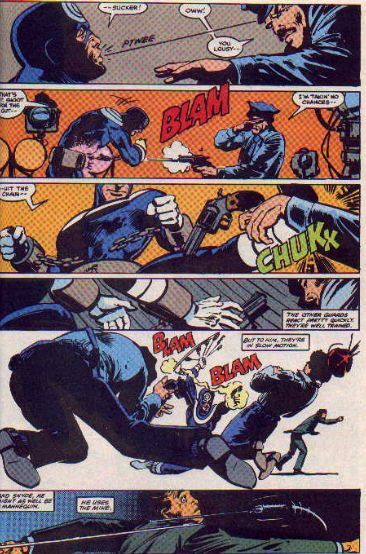 Elektra succeeds in silencing one of Urich's contacts but draws Daredevil's attention to the scene. 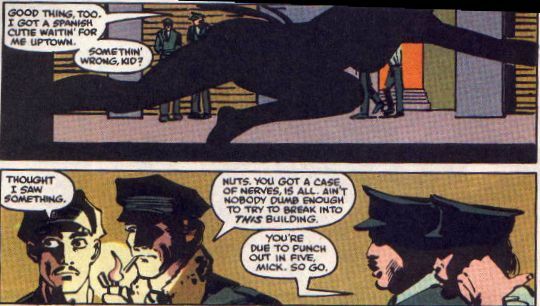 With a well-laid trap, she stops Daredevil and nearly kills Urich. Both of them manage to escape and later they discover the Kingpin's long-lost wife. Daredevil uses her to bargain with Kingpin and stop Cherryh's bid for mayor. Meanwhile, Bullseye plots his escape from prison. After a brief cameo with the Punisher, he escapes in a spectacular action sequence. Learning that Elektra has usurped his place as the Kingpin's assassin, he stalks her and eventually succeeds in slaying her. Matt Murdock/Daredevil cannot accept this; in a mad haze he opens her grave to feel her face with his hands--and confirms her death. Assassins from the cult known as the Hand intervene and a battle between them, Daredevil, the guest-star Black Widow, and Daredevil's mentor, Stick, ensues. 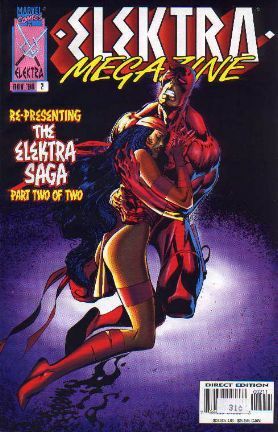 In the end, Devil's love for Elektra helps to cleanse her of her evil, and allows one of Stick's companions to bring her back to life. 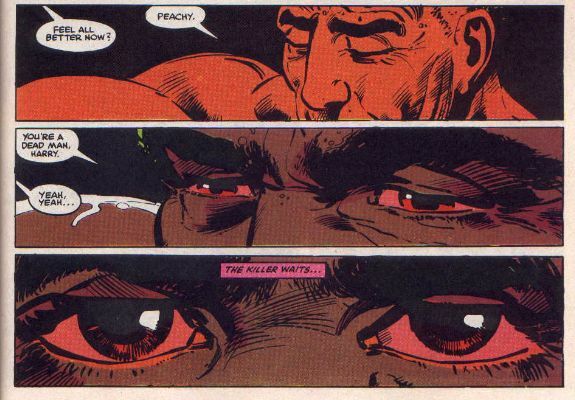 The Good: Frank Miller's art has always had a particular style. At some points it's more like looking at a watercolor than a comic book. I loved the expressions he gave even minor characters (see the eyes of this guard), and the rage he is able to imbue in his villains ( Bullseye). 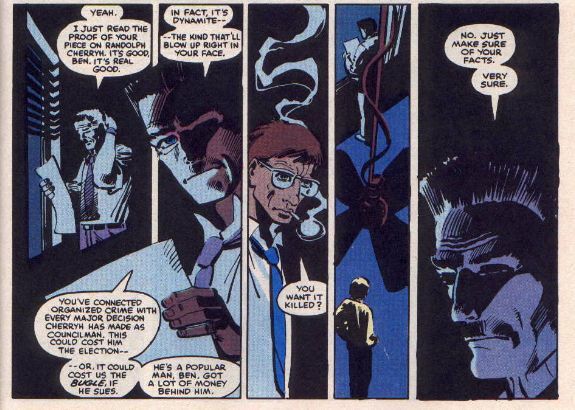 There is also a great sense of atmosphere and building drama in even some of the simpler scenes -- the window blinds and cigarette smoke in this scene make it seem more like a cutting-edge police drama than a comic.